Was Quetta an ISIS job or a JuA job? Or was it a joint effort? I found out about the Quetta bombing the way I do about most breaking news – through Facebook. My heart sank as I saw an article a friend had posted about a cameraman who worked for one of the same publications as I do. He was a father of four children and legal guardian to three others. On Tuesday, while filming a protest of lawyers outside a Quetta hospital he was killed in a suicide attack alongside 93 others. 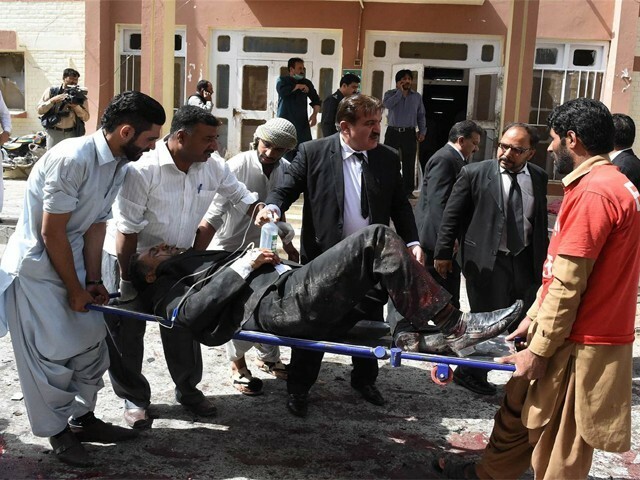 The attack – yet another in the violence-plagued south-western province of Balochistan – is said to have taken out an entire generation of Quetta’s lawyers. While I was writing this article, another attack, aimed at a judge’s cavalcade, injured 17 people. As tends to happen in the aftermath of a violent attack in Pakistan – or sometimes even while the event is still unfolding – media pundits, armchair commentators and general observers on social media jump the gun and start asking all the wrong type of questions. “If this is not terrorism then what is?” they ask. By now we are all too familiar with the melodramatic lamenting that inevitably follows each crisis of the last decade as people try to cope through memes, articles, tweets and Facebook posts. Truth be told, in Pakistan, the novelty of terrorist attacks remains. We do not tire of it nor does it tire of us. And so we continue to ask over and over again: How come the media goes to 24/7 coverage and the world lights up its landmarks when terrorists kill in Paris, Brussels, and Orlando but when terrorists kill in Beirut, Baghdad, and Quetta, the news is met with barely a raised eyebrow and rushed, regurgitated condolences offered by world leaders? Is it because the lives of the people of Pakistan matter less than the people of Paris? Kabbach’s words get at the heart of a popular, longstanding theory that white faces covered in blood are more newsworthy and attention-worthy than black or brown faces. It certainly is an attractive theory because a cursory Google search or some quick channel surfing pretty much confirms the theory’s viability. But that doesn’t change the fact that continuing to vent our frustrations over the lack of attention is a troubling and, ultimately, futile exercise that only winds up detracting from the sum equation of the tragedy: the lives lost, the livelihoods ended, the families and cities destroyed. Essentially, our all-too-familiar pattern of theorising, speculating and postulating following a horrible tragedy is useless and serving. It does absolutely nothing to help those who are trying to come to terms with the loss of their loved ones nor does it help the victims still fighting for their lives. Because we have rote memorised this familiar pattern, we know with measured certainty that in the upcoming days, possibly even weeks, the hash tags and solidarity posts will light up the darkened cyber pathways. But while our ‘thoughts and prayers’ will slowly flicker and burn out and we will all return to carrying on in a business-as-usual fashion, for Quetta the dust will have barely settled. And the state of Pakistan and its hodgepodge of politicians and self-proclaimed experts will continue to confuse us in the aftermath of Quetta’s chaos. So, while I understand, and to some extent, share the desire for global solidarity, the current dialogue is tired of detracting from the greater crisis looming large on the horizon of Pakistan. We should not be asking why a newsroom, a couple hundred thousand miles away, is not covering our story. We should be asking why – despite an entire generation of defenders of the law being wiped out – the people we have voted in and entrusted with positions of power and authority continue to grandstand with their heads stuck in a place where the sun doesn’t shine. Quetta, an already lawless wasteland, was turned into a literal definition of lawlessness in a matter of seconds. Forget changing your profile picture to a white candle flickering against a blackened background. It’s about ten years past the time to put out a call for a radical reconfiguration of Pakistan’s entire political and social structure. How is that in the wake of such atrocity we have Islamists like Hafiz Saeed (who has a $10 million US bounty on his head) getting significant media coverage for propagating chaos in the form of statements pinning the attacks on India. Even Balochistan Chief Minister Sanaullah Zehri has hinted at Indian involvement. Never mind that shortly after the attack ISIS’ Amaq news agency took responsibility for the attacks as did Tehreek-i-Taliban Pakistan splinter group Jamaatul Ahrar. While our leaders continue to confuse the easily confused masses, sending an already distraught nation on a goose chase towards the eastern border of Pakistan, the real issue that terrifies me to my bone marrow is how the state of Pakistan, despite having claimed success in its Operation Zarb-e-Azb, is still unaware when it comes to knowing who is who in the zoo of terrorist groups operating inside and around Pakistan. I’m not a national security expert but I know that co-operations and allegiances are not uncommon between Islamist terrorist entities. For this reason, it is possible that the conflicting claims for responsibility actually indicate the existence of a formal alliance between the two terrorist organisations. Or maybe it’s not. Either way, I find it hard to care if some media outlet across the world is investing talk time towards my country when the people running my country aren’t even sure what’s going on in their own backyard. And so to Pakistanis I say, quit worrying about the international community’s response (or lack thereof). We have bigger, more urgent problems dealing with the convoluted and complex mess brewed up by our own people inside our own borders. And to Pakistan, I say this: you literally had one job. Nawaz bin Salman bin Abdelaziz bin Sharif is not a leader. He always wanted to “negotiate” with terrorists. Still does. It doesn’t matter who USA labels as a terrorist. That’s what the Indian government said. Who cares what the Indian Government says. Modi is a terrorist whethere USA labels him or not. Hindus were the ones that were always taken over by Muslims. Your mentality doesn’t go beyond the words “taken over”. You should thank God that we Muslims of the subcontinent decided to break free from the British. Too bad you use Wikipedia for your information. What David Headley and Ajmal Kaasab said is “your” narrative. An Indian narrative. I don’t trust you enough to agree with what you say they said. No he is not a terrorist. You see here is what you people are wrong. We never converted to anything. We were the ones that came from Arabia to Sindh to spread Islam. It doesn’t matter who Pakistan labels as a terrorist. By the same logic Mullah Fazilullah of TTP is not a terrorist. Unless you call killing Sun_ni Punjabi soldiers in Balochistan and Karachi, which it isn’t?